English Grammar for International Studies is designed for students taking international programmes in higher vocational education, such as Business and Management Studies, International Marketing, International Finance, Business Administration, International Communication and Media, Finance and Banking, Hotel and Facility, and Tourism. Such programmes often have an international student body and therefore the language of instruction is English. English Grammar for International Studies caters precisely for these programmes since the instruction, examples and exercises are offered in English. Offering grammar instruction based on problem-oriented learning, the grammatical principles in the book are rehearsed in a variety of exercises and assignments using primary source texts, such as newspaper headlines, advertisements and internet texts. 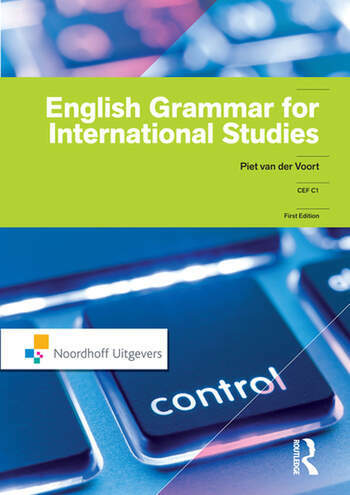 This book is eminently suitable for self-study, because of its step-by-step approach to English grammar, its transparent instruction, wide range of exercises and the possibility to check answers to questions on the accompanying website (www.englishgrammarforinternationalstudies.noordhoff.nl) which also provides a self-assessment test allowing students to monitor their grammar deficiencies.